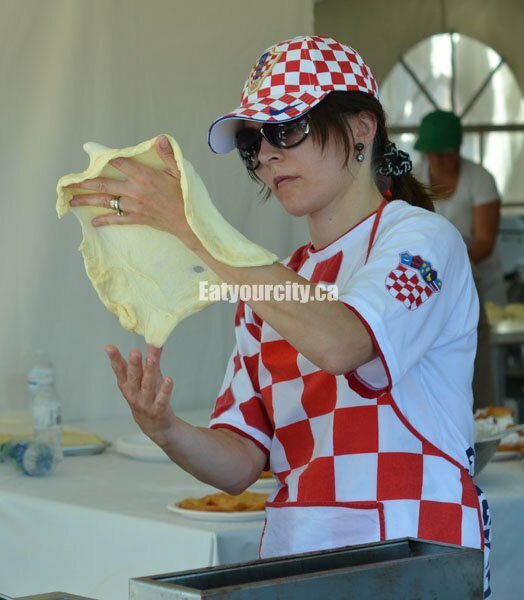 Eat Your City: Heritage Days, Edmonton, AB - Heritage Festival 2012 Day 1 with food, drinks and performances from 60+ tents and 80+cultures!! Heritage Days, Edmonton, AB - Heritage Festival 2012 Day 1 with food, drinks and performances from 60+ tents and 80+cultures!! Woot! A super hot sunny day filled with food, drinks, cultural performances from over 80 cultures! The little glutton inside me is jumping with glee! 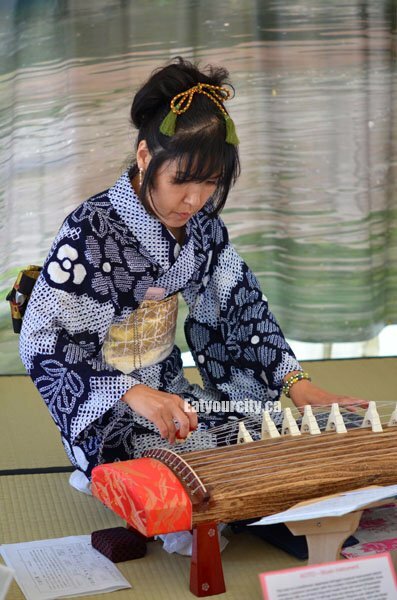 This outdoor family festival celebrating multiculturalism has grown every year, and this year, there's so many pavillions, cultural performances, demos and food to try, its almost overwhelming at the sheer size Heritage Days has grown to! We started off by dropping off a donation to the food bank, picking up a free bag and map of all the venues from various sponsors handing them out by the buses and start making our way towards all the tasty smells and music! 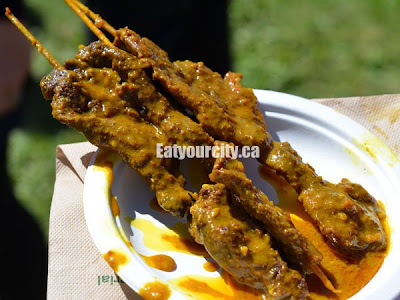 Our first stop was the Malaysia Singapore pavilion where we stopped off for Beef Satay, three skewers of marinated beef with an earthy fragrant curry peanut sauce. Available in chicken too. Mmmm! We strolled over to England , there were no steak and kidney pies, so we had a Sausage Roll instead. 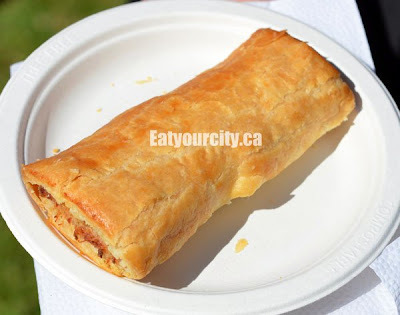 Made with a smooth mixture of mildly seasoned ground beef, onions and seasoned all wrapped in a super flaky pastry exterior. Mmmm! While lining up at the Croatia pavilion debating if we wanted rotisserie pork or lamb, we watched the making of Croatian Doughnuts – Deep fried dough fried topped with lots of icing sugar. Think gigantic elephant ear! 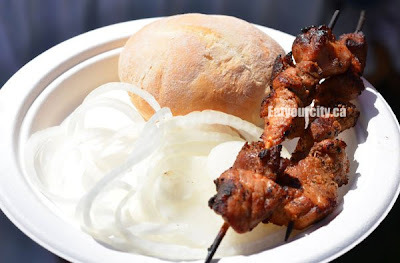 And we got the Barbecue Lamb as well - roasted on an open fire rotisserie style, and served with a side of refreshing coleslaw & a bun. 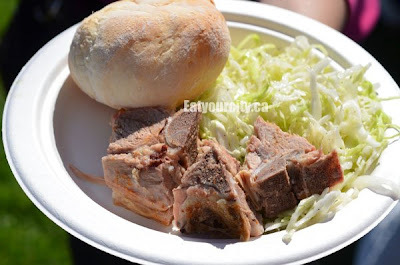 Bit dry and hard to eat, but nice and refreshing slaw. Will have to try the rotisserie pork next year! Next in our culinary trip around the world in less than a day was Thailand! We lined up in the heat along with others for the Siam Chicken Curry on Rice. Lots of thinly sliced moist chicken breast swimming in a coconut milk based curry sauce, along with veges​ and bell peppers. Kaffir lime leaves, coconut, and chilies add lots of flavor and heat to this dish. Spicy, but can't stop eating! 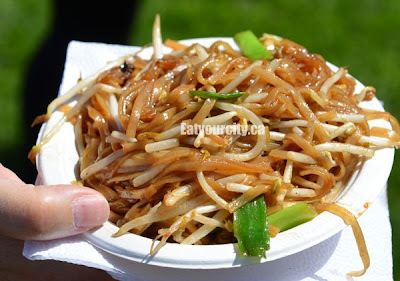 Auntie J also picked up one of my favs - Pad Thai!! Fragrant Thai noodles with bean sprouts and vege​s all tossed in a savory-sweet tamarind based sauce. Mmmmmm!! 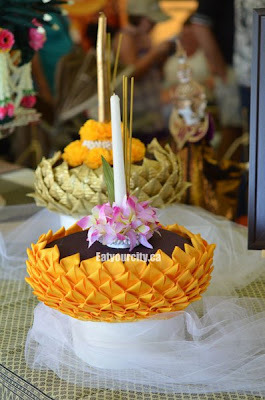 While my mouth was cooling off from the curry, we browsed a neat display of skills at the Thai pavilion.​. Now only if I could work magic like that with flowers and ribbon! 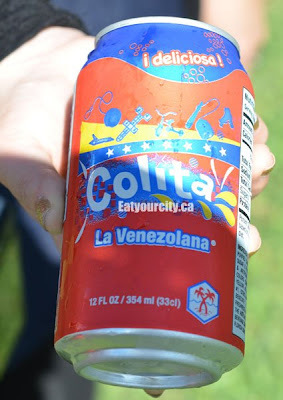 A short hop over to Venezuela netted us a cold refreshing drink: Frescolita. Similar to cream sodas but slightly less sweet. Perfect on this scorcher of a summer day! 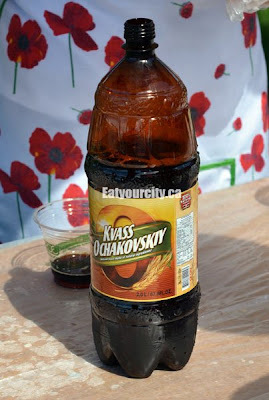 We also stopped off at the Russia pavilion to cool down with some non-alcoholic "Russian beer": Kvas, an authentic mint flavored bread beverage that tastes like root beer and beer mixed together. 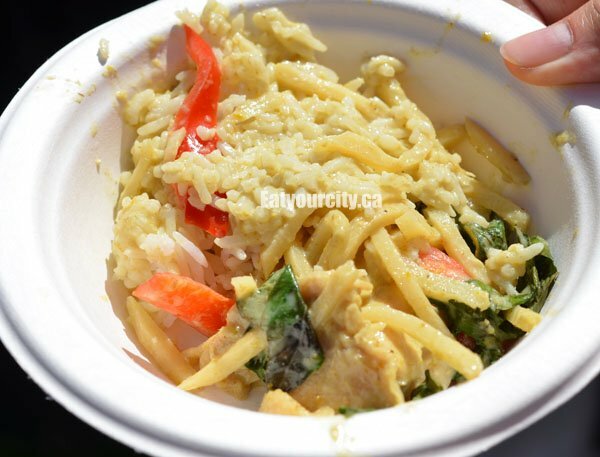 Melting in the heat, our lets eat cool things continued with Platano Conjelado at the Ecuador tent. 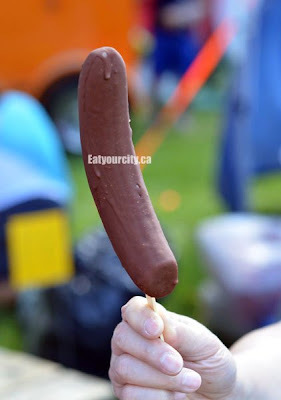 Translation: frozen super ripe bananas on a stick dipped in chocolate. Its healthy cuz there's an entire banana! After resting a bit in shade, we stopped off at the German pavilion for German Bratwurst! 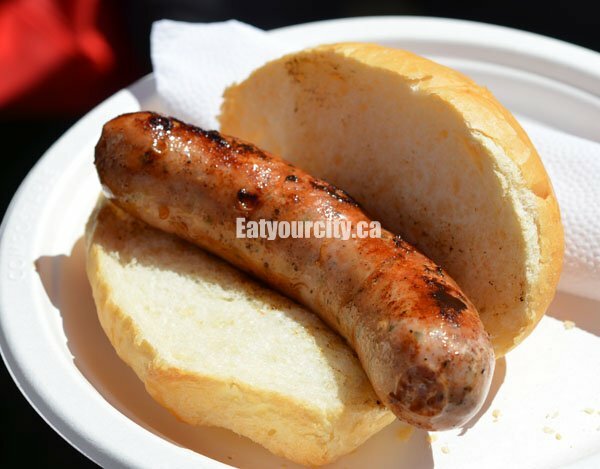 There's a huge line up for these moist juicy grilled German 100% pork sausages with sauerkraut on a bun. Served with mustard of course. We passed on the sauerkraut to save tummy room for more food! We had to stop off in Afganhista​n for my boyfriend's fav - Bolani!! 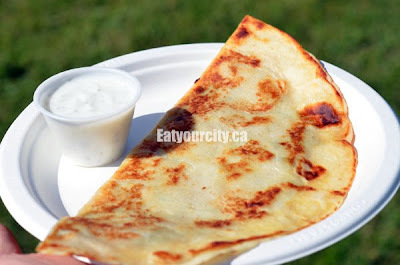 Pan fried roti-like dough has a thin layer of mashed potatoes, green onions and a hit of spice. Served with a cool and refreshing tazizki like dipping sauce... so good! Stay tuned for part 2 of Day 1!